Do you like to impress your friends and family? 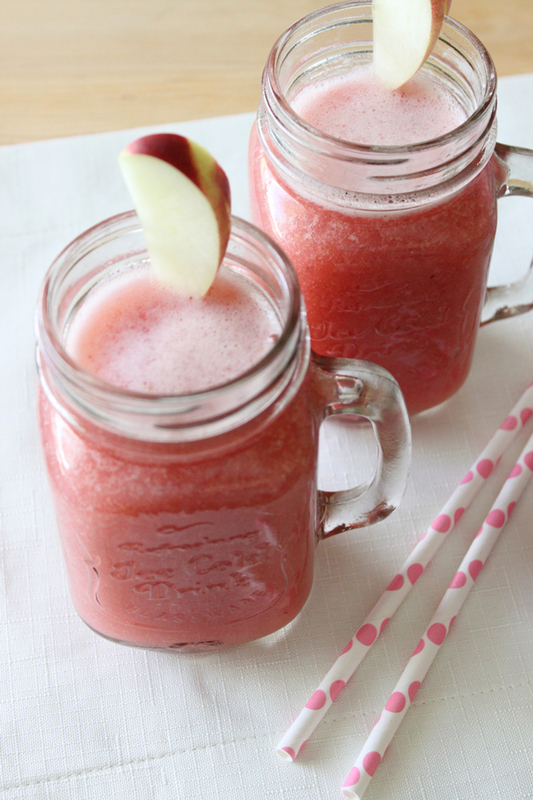 Do you get tired of plain old H2O? Do you have five minutes? If you answered yes to any of these questions, I’ve got just the recipe for you. It’s perfect for all of your upcoming summer get-togethers, whether you’re hosting or hope to be the host’s favorite guest, as well as those hot afternoons when you want to sip something with a little pizazz. I blended up this pink punch when hosting dinner for our families and tricked everyone into thinking that I was some kind of Martha Stewart. 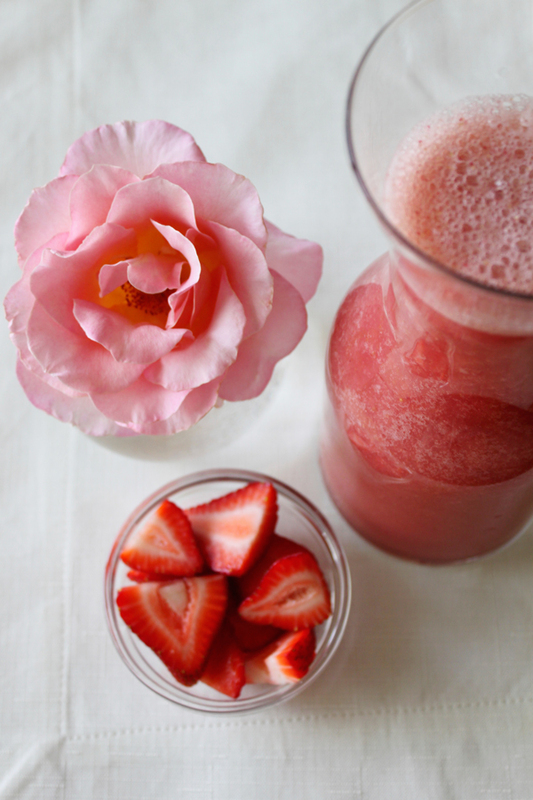 A combo of strawberries, white peach, rose water, and sparkling water, this drink is a hit because it’s pretty, fizzy, and filled with layers of flavors both fruity and floral. The best part? It takes no more than five minutes to gather the ingredients, plop them in your blender, and slice up some fruit for garnish (new discovery: a fruit garnish is one of the easiest ways to make a drink look fancy in less than three seconds; a fun straw is another). 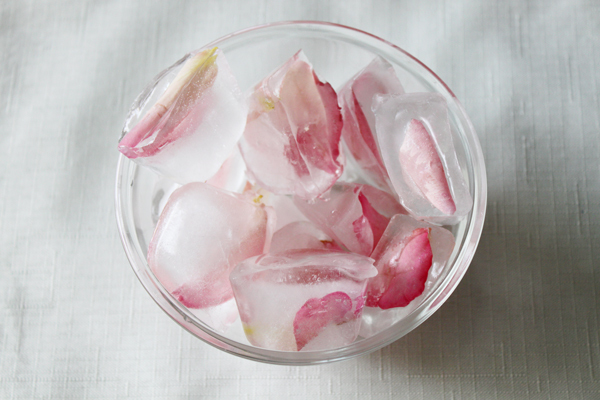 And if you want to really go above and beyond, you can pretty up your ice cubes by freezing rose petals into them. 1. 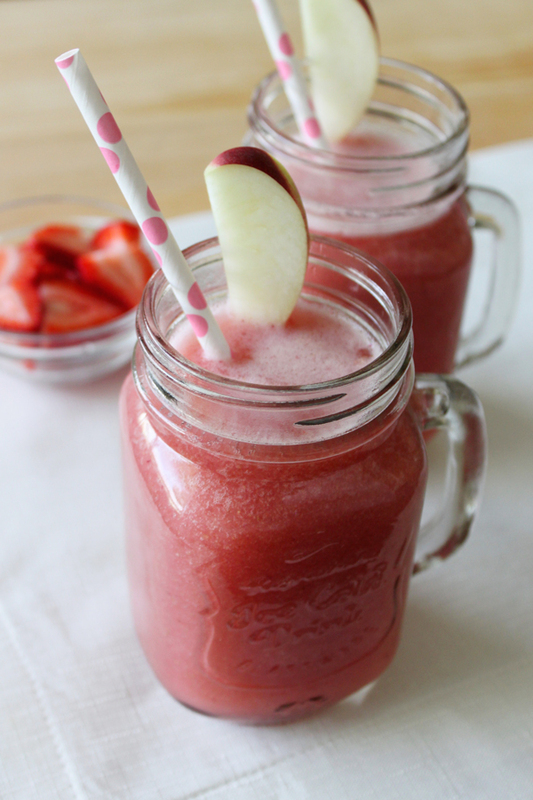 Add strawberries, peach, rose water and sparkling water to the blender and blend until smooth. Add stevia to taste. 2. Serve over ice and garnish with remaining peach slices. *Rose water is easy to make (here’s my do-it-yourself guide) and a lovely staple for both your kitchen and your beauty cabinet. You can also find rose water at various grocery stores, but it’s much more potent, so you’ll want to decrease the amount or else you’ll end up with perfume instead of punch. I’d recommend starting with a teaspoon, adding an additional fourth a cup of sparkling or still water, and adjusting from there. I tripled this recipe for our gathering of seven, and everyone went back for refills. If you want to shake things up and add a little booze, Hendrick’s Gin is a great option because it’s infused with rose and mixes perfectly with this slightly rosy punch. 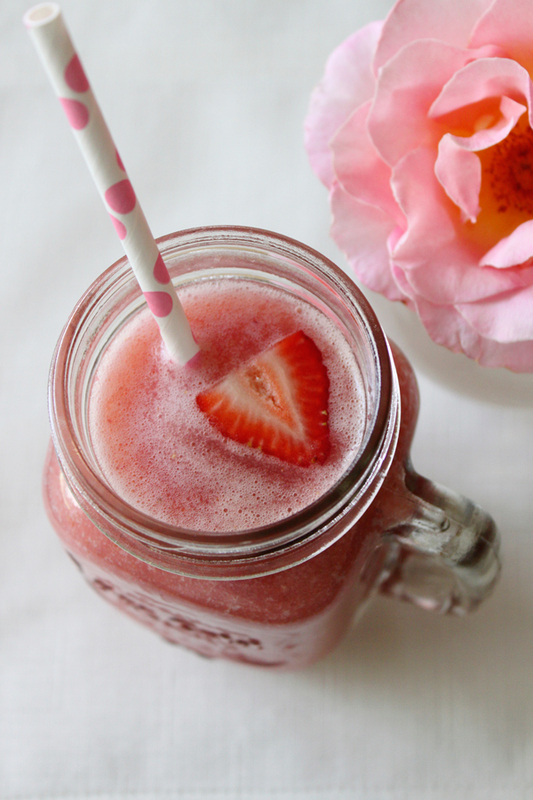 Happy summer sipping! This looks and sounds absolutely delicious! Totally bookmarking!